Kotlin allows us to implement Operator overloading for a predefined set of operators. We can implement them on class members or extension functions. These operators have fixed symbolic representation (like + or -). To demonstrate this feature I will override increment and decrement operators on a Counter class. Counter is a simple class with single integer field, we can either increment or decrement it. To override an operator we need to declare a function with operator keyword and the name of the function should be fixed name which should be corresponding to the operator. Below table shows the predefined function names for increment and decrement operators. 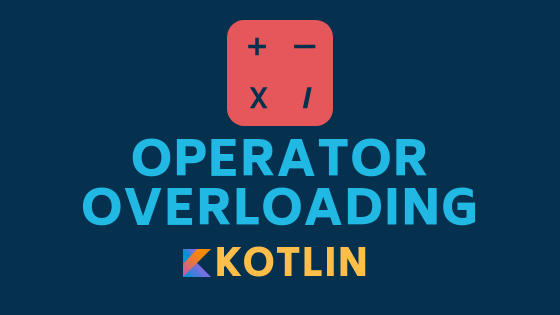 We can overload many operators but we are not covering all of them in this article so please read this kotlin documentation for full details. inc() and dec() are predefined fixed names to override increment and decrement operators and these functions should be declared with operator keyword. These functions returns Counter object with new value. Overriding toString() is optional, I did because I want to show the value in console. <2> Counter is incremented 10 times using the operator ++ At compile time Kotlin will lookup for the function inc() in Counter class and ++ is converted to inc() function call on the counter and the result is assigned back to counter. This is the reason we declared counter as var instead of val. Output shows that the counter is incremented and decremented ten times. unaryPlus() works like increment except it is not assigned back to itself. We need to store the result in the reference, like shown in below code. We went through some examples to overload ++, –, and + operators with class members and extension functions.